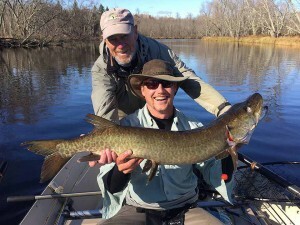 The friendly, professional Hayward, Wisconsin fly fishing guides at the Hayward Fly Fishing Company have years of experience fly fishing for muskies, pike and smallmouth bass in Northwest Wisconsin. This is what we do! 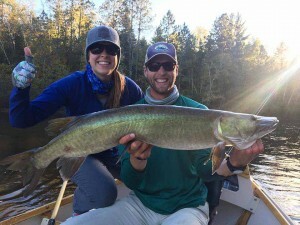 We welcome all ability levels to come and share in a unique, family-friendly, fly fishing experience on the beautiful rivers of Northern Wisconsin pursuing warm water species on the fly with us! Husband and wife, Larry Mann and Wendy Williamson, met in 1995 while guiding trout fishermen in Colorado. They continued to guide at 7 Lakes Lodge until 1998 when they decided to return to Wendy’s hometown of Hayward, Wisconsin “just to spend the winter” with the intention of returning to Colorado for the next guide season. They’ve never gone back, except for an occasional visit. 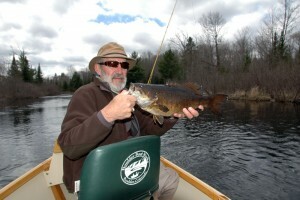 They have been guiding and teaching fly fishing in Wisconsin since 1998. Still avid trout fishermen themselves, they have turned their guiding efforts to the rivers of Northern Wisconsin, plying their drift boats for smallmouth bass and musky. 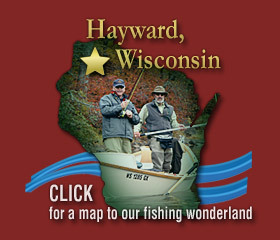 In January 2005, they opened the doors of the Hayward Fly Fishing Company. Larry and Wendy are all about making the fly fishing experience work for you. They look forward to seeing you in the very near future! Like many did in their youth, I spent as much time as possible in the out-of-doors. The lakes, rivers, brooks, and streams that I was so fortunate to explore, eventually led me to uncovering the wonders of a fly-rod. As a child, my first cast to a rising smallmouth with a loosely tied olive popper on the waters of Lake Owen near Cable, WI, was all that was needed to start my scheming to one day work as a full-time fly fishing guide. After graduating from St. Olaf College (UM YA YA! ), with persistence and diligence, alongside a lot of help from many good people, I am now lucky to say that my guiding and fly fishing has taken me all over the country and world. From Texas to Alaska, the Caribbean to the Bahamas, fly rods have led me to incredible places, none, however rival the waters that we have here at Hayward Fly Fishing Company. With that being said, our targeted species at the Hayward Fly Fishing Company are one of a kind. There are not too many places where you can catch a twenty-inch Smallmouth on a top-water popper, follow your next cast up with a body shaking take from the elusive Musky, all the while watching the banks of National and State Forest river-ways drift by. I will take it upon myself to make your day enjoyable. With my eight years of guiding experience in Alaska, Texas, and Wisconsin I look forward to instructing, rowing, story-telling, and laughing. I may not be able to guarantee catching fish, we all know how fish can be, but I can guarantee you a good time. The rivers alone will do that for us. After 23 years of frequently visiting Hayward, I could no longer resist its waters, so I decided to move here to guide fly fishing. 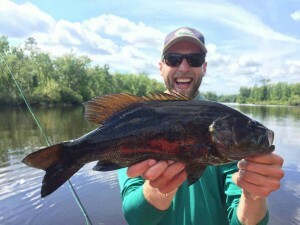 Growing up fishing Round Lake, just east of Hayward, I developed a love of smallmouth bass, but when I started fishing for them in the rivers of the area my eyes were opened to a different experience entirely. The smallmouth fishing was excellent, but I soon discovered that they weren’t the only species to be caught on the fly in moving water. 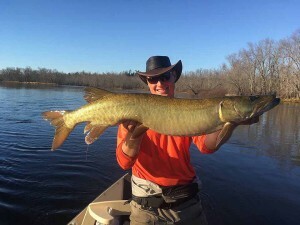 The muskies that haunt these rivers present an explosive challenge as well, and once you’ve seen them in action, you’ll never look at these meandering rivers the same way again. Fishing from a drift boat makes for an unmatched day on the water, and each float is different from the one before. 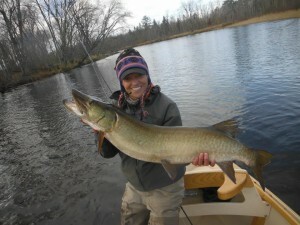 I’m happy to do what I’m passionate about and to help foster a passion for fly fishing in others, because whether casting for muskies or smallmouth, fly fishing here has a unique thrill to it, and it’s a thrill I look forward to sharing with you. 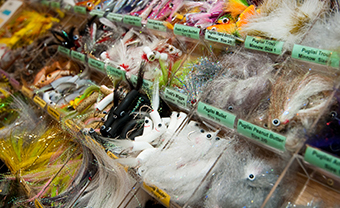 HUGE selection of musky, pike, bass, steelhead, trout & panfish flies available at HFFC! I just want to send you a message to let you know that you and your staff really provided an exceptional fly fishing experience this past weekend. Life is very short and so we must make the most of everyday. I certainly felt that without a doubt I was doing that on our guided trip. I met some fascinating people in the fly fishing community; Corey, Brett and Kaiser (a.k.a. Erik) are no exception. They are terrific guides and by the end of the trip they felt like good friends. I learned something each day and truly enjoyed fly fishing….They are each the consummate professional and all around good persons . . . no matter how many trout sets I made. I want to especially thank Dr. Kaiser for curing my trout set depression. I really can’t wait to get back up there. Take care and tight lines to you and your staff.